Young volunteers visit ethnic people in Lai Chau northern province, who suffered from torrential rains. 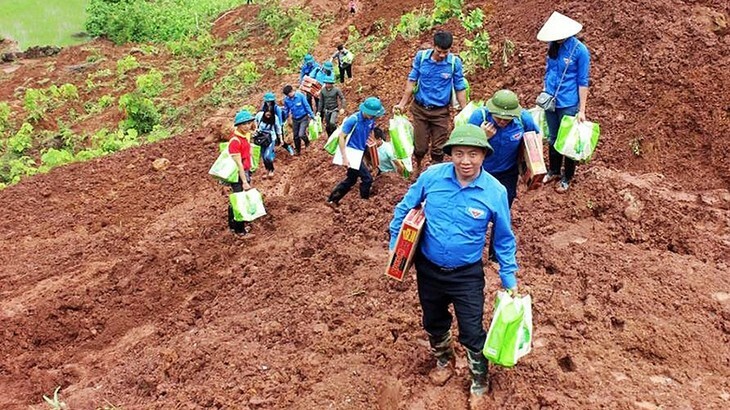 Like thousands of others, every summer, Luong Hoai Thu, a 3rd -year student at Hanoi Foreign Trade University, participates in the Green Summer Volunteer Campaign, travelling to remote, mountainous border areas to help the local people. Nguyen Dinh Kien, a student at the National Academy of Public Administration, has been to 10 places around the country in four years of volunteering. The gratitude and affection of the locals has taught him how meaningful his service is to them and has encouraged him to continue volunteering. “There are many models of volunteering but winter programs seem more meaningful because ethnic minority people in remote areas suffer more during this time of the year. These programs counter the winter cold and bring them a bit of warmth. Last year I organized a 2-day volunteer trip to the border area in Huong Lien hamlet, Ha Tinh province to deliver gifts to the locals and get to know their living conditions,” said Kien. For several years, Phu Tho province"s students at the Academy of Journalism and Communications have provided free steamed sticky rice to homeless people in Hanoi every evening. Student Dinh Bao Son says the servings of rice are both filling and warming. “At night we ride bicycles to distribute steamed sticky rice to the homeless. We often go to the parks in Hanoi. Such volunteer activities give us emotional satisfaction and help us understand other people better,” he added. A desire to help disadvantaged patients motivates members of the “Footprints of Youths” club to serve free porridge and rice to patients at Bach Mai Hospital in Hanoi. Club member Cao Viet Tuong Vi said they believe the spirit of giving will live forever. Donating blood is a good deed that Nguyen Thu Luong of Hanoi has performed 36 times. She says she is happy that the blood donation campaign has spread throughout the community. “I’m happy that my blood will flow in other people and could save their life. That’s why I donate blood so often. When you look at the faces of blood donors, you can see their joy. I hope more and more people will respond to the campaign,” Luong noted.